Mastebolin from the Indian company Alpha Pharma is an anabolic androgenic steroid of a new generation. Due to the main active component of drostanolone propionate, the drug has a complex effect on the body. Available in the form of fluid for injection. 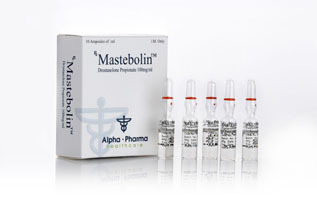 Mastebolin Alpha Pharma is designed to consolidate the results obtained during sports training. It is also used to increase endurance and strength indicators in wrestlers, athletes, and boxers. In order for the drug to show the desired effect, it is necessary to inject it no more than 500 mg per week, breaking the dose into 3-4 times. Duration of application depends on the individual needs of the athlete and previous experience with the use of such steroids. The main active ingredient, a derivative of the hormone dihydrotesterone, is actively used in bodybuilding and other sports because of its characteristic feature – its intake does not cause accumulation of fluid in the tissues. excretion of excess fluid from the body. Among the side effects of steroid use are baldness, acne, an increase in prostate volume, increased aggression. It is not advisable for women to take this drug because of the development of pronounced viril syndrome. Mastebolin course is most often used by athletes to consolidate their results. The optimal dosage of Drostanolone is 400-500 milligrams per week. When this injection is carried out 3-4 times in 7 days. The duration of the course, as well as the dosage, is selected on the basis of the physiological characteristics of the athlete, his experience with the use of anabolic and androgenic steroids, the ultimate goal and a number of secondary factors. It is best to consult with a sports doctor before starting to use a steroid. Regarding how to take Mastebolin in combination with other AAS, considering its relationship to androgen receptors, the best drugs for sharing are Oxandrolone and Winstrol. The latter reduces the level of globulin, which allows to obtain an excellent synergistic effect on the “drying” cycles. If the goal of the athlete is to gain muscle mass, it is recommended to combine Mastebolin with Testosterone. But in this case it is necessary to include gonadotropin, since the production of endogenous testosterone is largely suppressed. Due to the low anabolic index, the drug is very effective as a fat burning agent, but at the same time it often causes androgenic reactions. The main side effects of Mastebolin are virilization (in principle, it is generally not recommended for women to take Drostanolone), acne, baldness, prostate hypertrophy and increased aggression. There are also positive aspects – the absence of such phenomena as fluid retention, liver damage and rise in blood pressure.